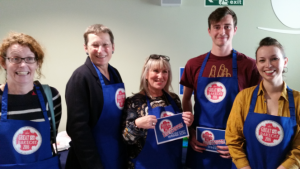 Today was the inaugural SET Bake Off for students and staff, judged by our university’s very own Vice Chancellor, Debra Humphris. And what a success it was with lots of tempting treats to tingle our tastebuds. After the judging, slices of cake were sold off for charity. The charity, drawn at random from a number of suggestions by staff in the school office, is City Cat Shelter, undoubtedly Brighton’s number-one implement of cat welfare’s neutering programme.